Termite detection dogs were used in conjunction with conventional inspection. Positive indication by termite dog of live termite activity was observed and confirmed visually. 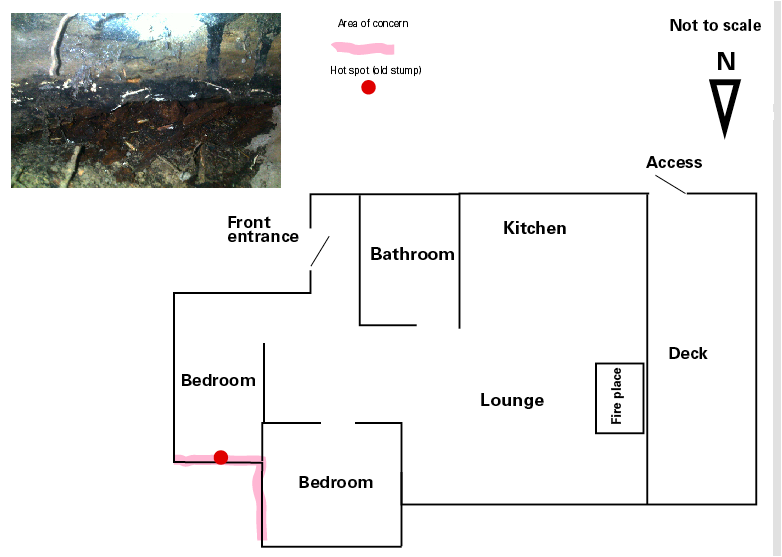 Attached is a plan indicating were live termite activity was found including photo of activity. There appears to be a substantial infestation along skirting boards and in old timber stump positioned in NE side of home. Skirting boards mentioned are accessable via subfloor and buried under garden mulch therefore in direct contact with earth. Build up of garden is also restricting cross ventilation contributing to damp conditions. Also old timber stump remaining alonside new concrete stump is also infested.